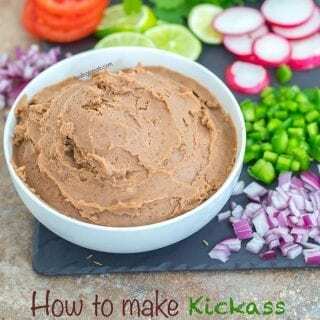 How to make refried beans in a pressure cooker? The process is very simple and you don’t even need to soak your pinto beans overnight. Place ingredients in the pressure cooker and let it cook by itself. Use in tostadas, chili or enchiladas! Someone once told me that refried beans are to Mexican food like mashed potatoes are to American food! Since its something I use so often, why not make it at home…. …. and make it in my favorite kitchen gadget of all time! Yes, friends, I have made them in my pressure cooker and I couldn’t tell them apart from the canned version. I discovered that refried pinto beans are the easiest thing to prepare in a pressure. There was no need to soak them overnight, which is always a plus! I also didn’t have to put any fancy ingredients or add ingredients I couldn’t pronounce. I left them cook in the pressure cooker for sixty minutes and then used a blended them until they were smooooooth! Can you tell that they are homemade and not from a can? They look exactly alike. Why are they called refried beans? Are they fried twice? So, why the word “fried” in their name? After they are boiled and mashed, these beans are usually fried, roasted or baked before being put into a recipe. To fry them, the chefs normally add a couple drops oil in a skillet and put the mashed beans in it. After a few minutes of “frying” them this way, they are transferred into a recipe. The frying process isn’t necessary, but, it does make the recipe much more delicious. Are refried beans high in fiber? If you are buying them from the store, chances are they are not vegan (unless its labeled as such on the can). 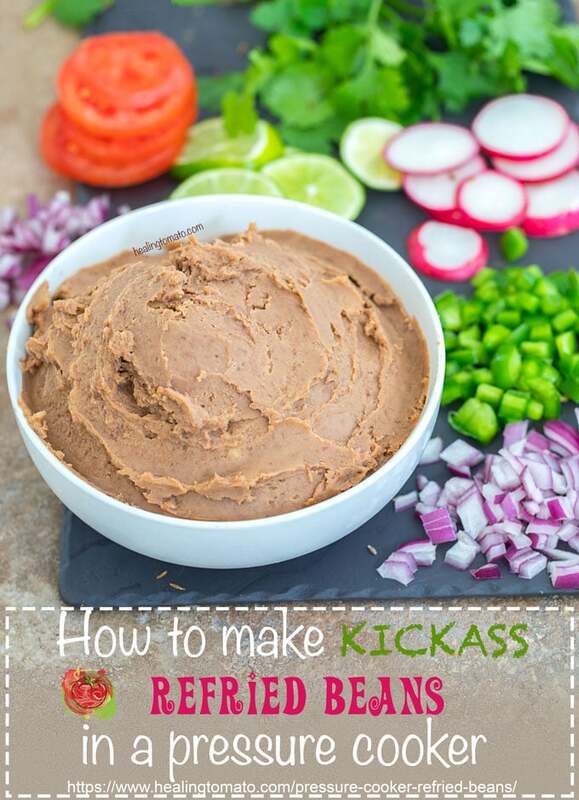 Most of the refried beans on the shelves use lard which is a no-no for vegans. 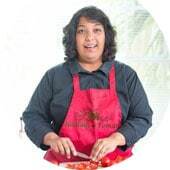 Those that are labeled vegetarian are indeed vegetarian, but, might put cheese or dairy products in their recipes. Even if they are labeled vegan, I think I would like to make my own because I can put all kinds of ingredients in it. For my recipe, I added 2 of my favorite products. One is beet juice, which is becoming a staple in most of my pressure cooker recipes. I put the beet juice in my red lentil soup recipe and it was DELICIOUS! The other ingredient I used was (affiliate link) liquid smoke which is vegan and it was so good! It made this recipe that much more delicious. I loved the smokey flavor it gave to the beans and I used it in a tostada (recipe coming soon) which was soooo delicious! I think I am going to be using liquid smoke a lot more in my cooking. I am sad that it took me this long to experiment with it, but, it better late than never! Can refried beans be frozen? YES! That’s one of the best part of making them at home. Instead of putting them inside containers, I put them in ziplock bags and labeled the date on them. After that, I put them in the freezer and I imagine they will be goo for about 6 months! The best way to thaw them is to place the ziplock bag in hot water for about 10 minutes or until they are soft enough to be work with. Place them in a strong bottom pan and heat them up before adding to a recipe. Can you imagine all the wonderful, countless meal prep recipes they can be put into? They will be huge time savers! I will speak for my recipe only in this case and say, no! They don’t have any form of gluten in them which is yet another reason to make them at home. I used dried pinto beans in this recipe which are naturally gluten free. I also don’t add any kind of gluten-type of ingredients. 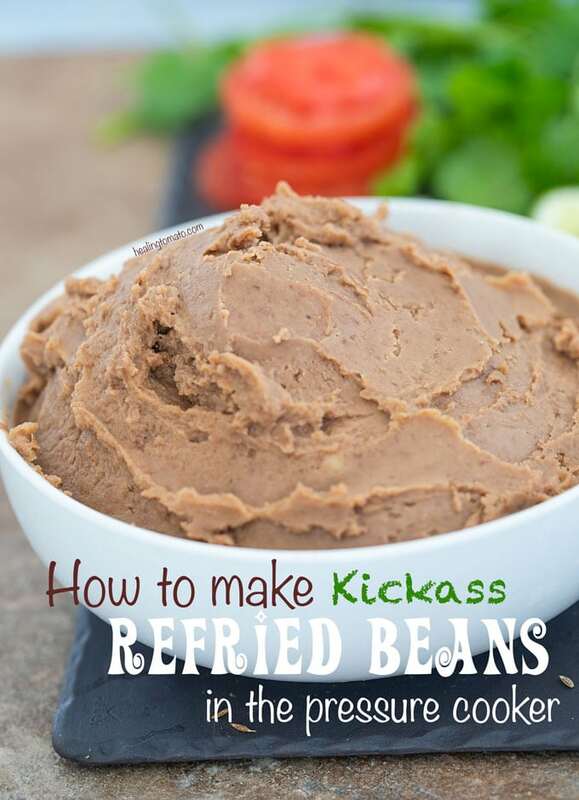 How do you thin refried beans? My version is more of a paste because I am going to use them as a paste in an awesome tostada recipe. However, if you want to make them more of thinner version or soupy consistency, add more water or beet juice. You can go a little wild and add coconut water or some almond milk. 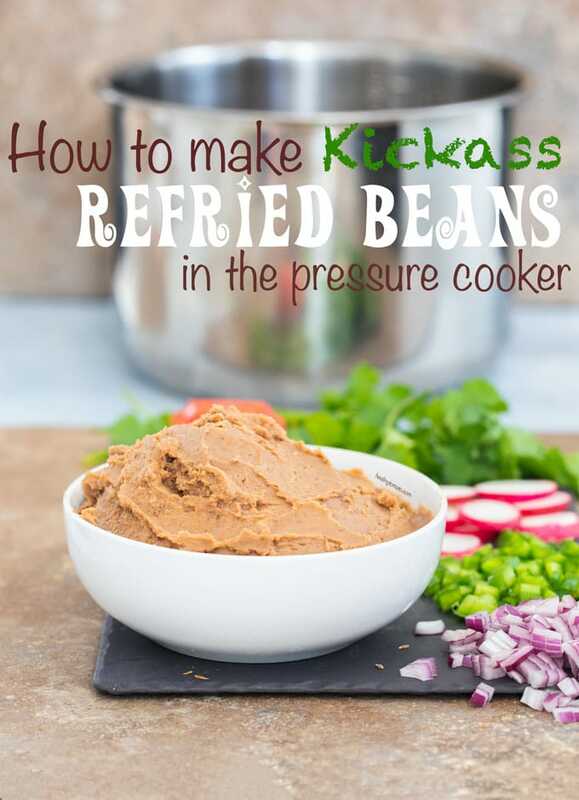 I made a quick video (see below) of how I made these refried beans in the pressure cooker. If you want the closed caption version, you can check it out on my YouTube channel. Update: This recipe and instructions are based on my Bestek Pressure cooker. If you are using an instant pot, you may have to adjust the amount of water. Some of my readers are saying that they used about 5.5-6 cups of water in their instant pot. Please adjust the water amount based on your device. So, in what recipe are you going to use these refried beans? If you like this recipe, check out my best pressure cooker recipes. 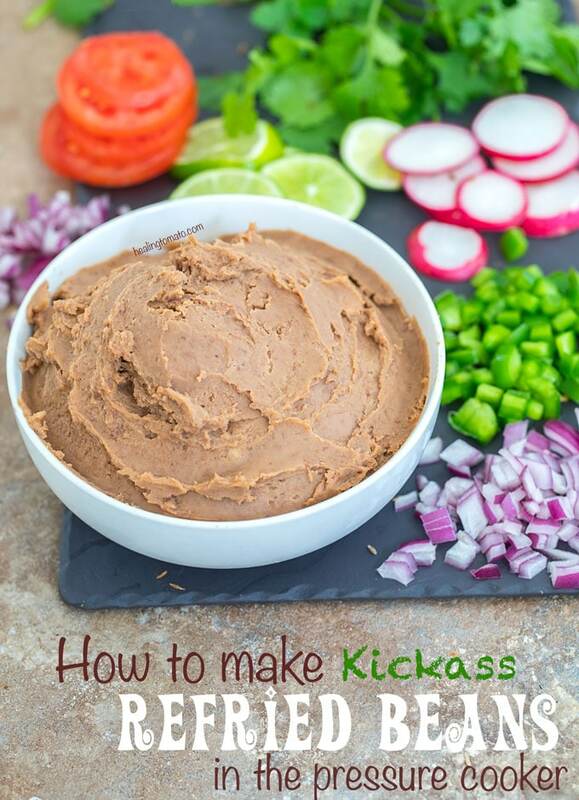 Make no-fuss, kickass refried beans in the pressure cooker. - The beet juice I used was the liquid that beets are marinated in. You can also juice about 1 beet and add it to the recipe. Even simpler, you can roughly chop beets and add them to the recipe. - I used dry pinto beans that didn't need to be soaked. I don't recommend using canned pinto beans because they have been processed. If you do end up using canned pinto beans, you pressure cook time will be less than 60 minutes. The printed recipe doesn’t list the taco seasoning used in the recipe’s video.